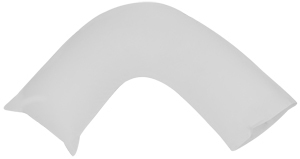 The Luxury V-Shaped Boomerang pillow provides orthopedic support to the upper body, neck, and shoulders. Its design is most useful in upright or semi-upright positions, especially when reading or watching TV. When lying flat, the V-shaped pillow cradles the upper body to promote ultimate comfort and stability. The two sides of the pillow help cushion arms and align the spine. The innovative shape fits perfectly to the body, allowing for multiple sleep positions. Get all the benefits of a comfort-fit product without overspending. The V-shaped pillow is easy to clean and made to last. Its 100% Cotton Sateen exterior is soft, durable, and breathable. Its BioFresh fibre filling is also anti-dust mite and anti-bacterial. The BioFresh fibres are hollow at the centre to retain pillow shape after many uses and wash cycles. To reduce respiratory irritation and guarantee freshness, simply machine wash and tumble dry on low. For added freshness, cover your pillow with any standard V-shaped pillowcase. The V-shaped pillow provides optimal cushion and firm upper body support. Its quality materials ensure lasting comfort and a like-new feeling that lasts after multiple wash cycles. After drying, the fibrefill stuffing reassumes original shape with added volume.